State wall maps are easy-to-read and are as aesthetically pleasing as they are useful. A great resource for the study of state history, regions, economics, government and geography. All maps are laminated , printed on tough non-tear material ,markable. The maps are completely up to date with accurate references offering a wealth of geographical information. Suitable as classroom reference tools. 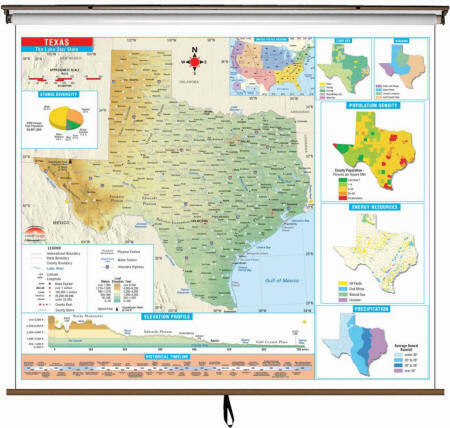 State wall maps are printed on panels measuring 64"W x 54"W.
Thematic Wall Map is the perfect teaching aid for state studies and related subjects. Political/physical maps with hypsometric colorations; shows county boundaries, interstate highways, county seats, cities and towns and state regions. * Offered for the following states: Arkansas, California, Florida, New Jersey, New Mexico, New York, North Carolina, Oklahoma, Texas and Utah. Maps correlate with state standards and curriculum guidelines. They are constructed of heavy paper, with a write-on/wipe-off laminated finish that can be used with water-based or dry erase pens. Mounted on spring roller with backboard. Primary (K-3) Thematic Wall Maps feature basic state information; shows the state capital and major cities; state flag, state seal and motto, state tree, flower and bird. 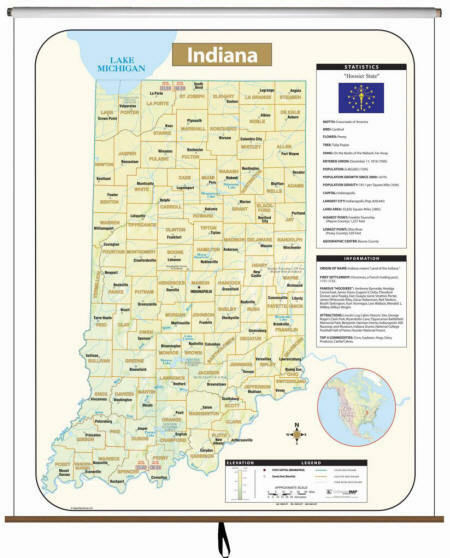 Intermediate (3-8 grade) Thematic Wall Maps feature a historical timeline and elevation profile, plus insets of land use, ethnic diversity and population, average precipitation and more. Printed in color with a markable and washable surface. Indexed on the face of the map. Mounted top and bottom with hanging rails or mounted on spring roller. 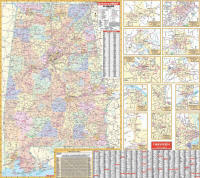 Details include all state and federal highways, major waterways, state universities, military installations, major airports, cities and towns, state and national parks, wildlife areas, mileage charts, mileage circles, longitude and latitude lines, county names and boundaries, exit numbers, and points of interest. Colorful and easy to read. A colored bar graph clearly shows variations in elevation. Includes boundaries, geographical features, time zones and more. in Bloomington, Indiana, and to other schools, Colleges, private and government institutions in US and abroad.